Fantasia (film) One of the most highly regarded of the Disney classics, a symphonic concert with Leopold Stokowski and the Philadelphia Orchestra, embellished by Disney animation. Directed by Samuel Armstrong, James Algar, Bill Roberts, Paul Satterfield, Hamilton Luske, Jim Handley, Ford Beebe, T. Hee, Norm Ferguson, and Wilfred Jackson. Narrated by Deems Taylor. Includes eight sequences: Toccata and Fugue in D Minor (Bach), The Nutcracker Suite (Tchaikowsky), The Sorcerer’s Apprentice (Dukas), Rite of Spring (Stravinski), Pastoral (Beethoven), Dance of the Hours (Ponchielli), Night on Bald Mountain (Moussorgsky), and Ave Maria (Schubert). Premiered on November 13, 1940, at the Broadway Theater in New York. The film was presented in Fantasound, an early stereo system, devised at the Disney Studio, but which required theaters to be specially equipped. Because of the expense, the film originally opened in only 14 theaters. The stereo sound enhanced the effect of the movie and won special certificates for Walt Disney, technicians William Garity and John N. A. Hawkins and RCA, and for Leopold Stokowski and his associates (for unique achievement in the creation of a new form of visualized music) at the 1941 Academy Awards. 125 min. New interest in the film in the 1970s led to a new sound track in 1982, with the orchestra conducted by Irwin Kostal, narration by Hugh Douglas, and a recording in digital stereo, but its full-length restoration in 1990 brought back the original sound track, while trying to duplicate some of the effects of the Fantasound presentation. The film was re-released theatrically in 1946, 1956, 1963, 1969, 1977, 1982, 1985, and 1990. Released on video in 1991. Corey Burton replaced Deems Taylor on the DVD. Fantasia has taken its place as one of the great cinematic classics of all time. 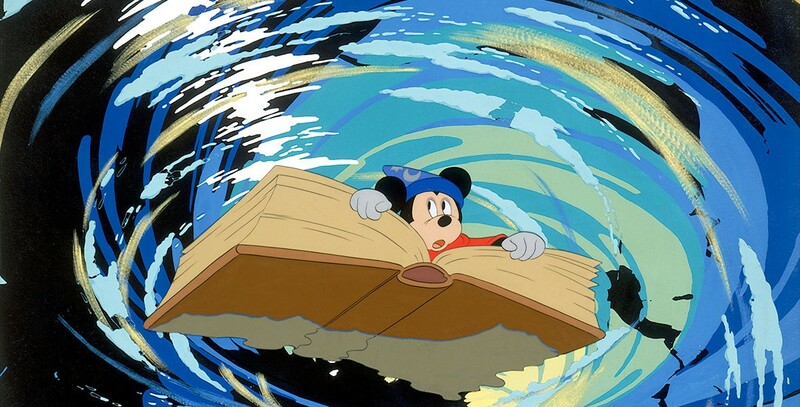 It took 60 years, but in line with Walt Disney’s plan to add new segments regularly to the film, Fantasia/2000 retained The Sorcerer’s Apprentice but added eight new sequences.